The United Food and Commercial Workers has stepped up its fight against Bush administration use of “no-match” Social Security letters against workers whose on-the-job identification doesn’t match what’s in government files. 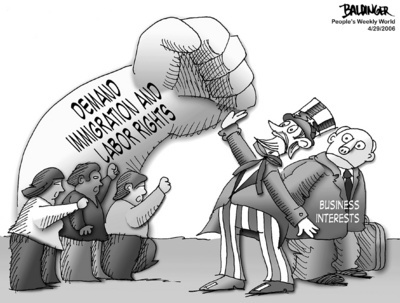 The government uses the program to pressure companies to fire employees and to force workers to prove “legal” status or face deportation. The UFCW, joined by the Los Angeles County Federation of Labor, the American Federation of Government Employees and various business and community groups, is saying it will renew the fight against the Department of Homeland Security in court on this issue. The renewed court battle is necessary, the UFCW and its allies say, because of recent DHS action. In response to a federal court ruling last October that blocked the use of the letters, the DHS re-issued its proposed “no match” rules on March 27. The department said it is promulgating the rules “without change,” even though a federal judge halted their enforcement because of widespread problems with accuracy of government records. Ester Lopez, the UFCW’s director of civil rights and community action, said the rules are unfair to both companies and workers because they rely on faulty records, the government’s social security rolls. “Companies that want to do the right thing, to follow the law and protect their workers, find themselves in a muddy situation,” she said. Companies have pulled out the no-match letters just weeks before union representation elections, Lopez said, and the organizing campaigns fell apart. DHS suspicions of “no matches” were used in the agency’s infamous raids on six Swift & Co. meatpacking plants last year. In those raids more than 1,200 workers were rounded up and held incommunicado for many hours. All but 62 were legal residents or U.S. citizens. The DHS rules say that if records at the workplace don’t match records at the Department of Social Security, companies must force workers to prove they are here legally before 90 days elapse. Failing that, the companies must fire the workers or face penalties. The UFCW and its allies note that, as late as 2006, before the no-match program began, the Social Security database contained 18 million discrepancies. These ranged from transposed Social Security numbers to mix-ups with married and maiden names. Some 70 percent of the “no matches” involved records of U.S. citizens. “This will lead to discrimination against and problems for millions of people,” declared Maria Elena Durazo, head of the Los Angeles County Federation of Labor. In one example, Fernando Tinoco, a 30-year legal resident of the U.S., tried to get a job with Tyson Foods on Chicago’s South Side. The company got a “no match” letter for him and, despite written statements from Social Security that he had been a citizen for 18 years, the human resources director refused to believe him, threatening to call the police and have him arrested when he showed up with the letter. He never got the job and eventually became a custodian at a Catholic high school. In Texas, industry and labor leaders are united in warning that the DHS proposed rules could cripple the regional economy. Business leaders have organized a lobbying group, “Americans for Immigration Reform,” to fight the new rules. The group, with 1,800 member companies, expects to raise $10 to $15 million from the business community and hire staff to press for comprehensive immigration reform. It estimates the Houston metropolitan statistical area has 250,000 undocumented workers who add $27 billion to the regional economy. Government workers have also joined the fight against the DHS rules. Witold Skwierczynski, president of AFGE Council 220, explained that workers at the Social Security Administration are being asked to take on ever-increasing loads by a mean-spirited and vindictive Bush administration. He said that recently the administration has demanded agency workers run checks against Social Security records on the eligibility of millions for prescription drug and other programs. All of these demands are made, he said, with no increases in staff. James Thompson contributed to this article.